30ft Carbon Fibre / Foam Sandwich Racing Trimaran for Mike Reppy. After winning class 3 in the 1988 CSTAR in Damiana, the 42ft Tri. I had designed for him in 1982, Mike decided to try and raise money for a bigger racing boat. In the meantime he would build a 30ft racer as a test bed for some new ideas. Initially we started with and all out day racer for San Francisco Bay, but soon Mike decided that he wanted to do the Transpac as well, and that the boat should be demountable so that he could ship her back from Hawaii. 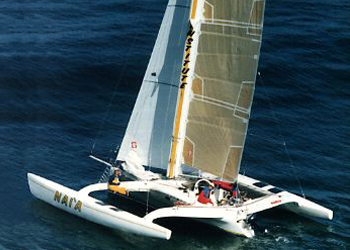 I had already designed two successful 30 ft offshore racing trimarans, Caledonia, which had knocked over 6 days off the transatlantic record when winning class 6 in the '88 CSTAR, and Shockwave. Shockwave was definitely faster than Caledonia, but when Mike talked about a new boat I had a hunch that by doing some thorough research and incorporating my latest ideas on rig efficiency, we could make another significant leap in performance. My research indicated that there were 3 basic trends in outrigger shape currently on the racing scene. The first was the type I had developed from my early racers, like Brittany Ferries GB, and Great American. These had the centre of buoyancy well forward, and the stern tapered out to a point. In later developments, for instance in Caledonia and Shockwave, the stern had become more of a canoe shape, but was still very fine. The logic behind this shape is in the article shown in reference 1. The total displacement of the outrigger had gone up from around 150% for Brittany Ferries GB, to 190% in Shockwave. The second shape was a cross between what Nick Bailey and Nigel Irens were using. Hulls with a transom stern, a reasonable amount of rocker in the hull profile, and displacement of 190%. The third shape is the one the French favour. Virtually no rocker along the keel line, a very full transom, and at least 200% buoyancy. Finally I chose a fourth shape. This was a thinner version of the Shockwave hull. I wanted to check whether a deeper thinner hull was better than a fatter shallower one. So we tank tested those 4 shapes, at a length to beam ratio, at mid displacement, of around 13.5 to 1. I chose that ratio because the Taylor's series of tank tests has already indicated that there is this is an optimum L/B ratio for long thin hulls. Also it matched the amount of outrigger immersion I wanted at mid displacement to keep the windward hull clear of the waves. We tested each of the 4 hulls at three displacements, (i.e. at three different depths of immersion) and at 6, 12, and 18 knots. I also looked at the effect of trim on drag (i.e. how much the boat is slowed by bow up or bow down trim). When I analysed the data from the tank test, what I was looking for were the trends in the above factors. If life was simple, all the factors would be at an optimum in the fastest model. However the same hull was not always the fastest at each displacement, nor at each speed. As the hull was pressed deeper into the water different factors became more important in determining drag. To complicate matters further, it is possible to have the hull pressed down into the water through the full range of displacement at each speed. For example; Sailing upwind in force 4 the out rigger would be fully immersed, and the speed between 12 and 14 knots. Fast reaching the hull may be fully immersed, and the speed 18 to 22 knots. Off the wind the hull may be half or even quarter immersed at 20 knots, and so on. Nevertheless, when cross referencing to other tank test work I have done, I was able to identify the combination of values that were always in the fastest model at each speed, over the range of hull immersions. So when I drew the final shape, I made sure that all the factors were at least at the value of the fastest model at each displacement. This meant that in theory the final shape we used would be faster at all speeds than any of the test models. I was amazed at the huge variation of performance in the models. The French shape, (full transom - no rocker,) had 37% more drag than the Caledonia shape at 40% displacements at 6 knots, and between 9 and 14% more drag at all displacements at 18 knots. At 12 knots the performance was the same as Caledonia at 80% displacement, increasing to 9% more drag at 120% displacement. This was a surprise. I knew that the hull would have more drag at low speeds because of the high wetted surface area, but because of the fashion in France to use the shape I had been seduced into thinking that it may be fast at high speeds and high displacements. This is definitely not so. I decided on a Barlow wing mast built in Glass, foam, and Carbon. There is no boom and the mainsheet track runs along the aft beam. This works very well and saves a significant amount of weight. The high aspect Jib is sheeted on an athwartships track at around 5 to 6 degrees to deal with the very narrow apparent wind angle when sailing to windward at 13 knots. Off the wind there is a large light Genoa, and an asymmetrical spinnaker set flying on a permanently rigged carbon pole. By using Carbon Fibre and PVC foam, with integrated structural techniques, the hull weight can be carefully controlled. The net effect is a strong, light displacement hull with a high long term fatigue life. Integrated Structure is a computer aided design method which I originally developed for the highly stressed ocean racers of the North Atlantic circuit. The structure of the boat is designed in a similar way to a sail where highly loaded areas like reef points and clew are patched out into the lighter body of the sail, the layers of cloth increasing from the lighter body of the sail out towards the clew or reef cringle. Highly loaded fittings like chainplates or beam attachments are dealt with by spreading unidirectional fibres from specially designed fittings into the body of the hull or deck until the stress is distributed over a large enough area to ensure that structural failure of the boat itself is virtually impossible. Fibre quantities are carefully calculated to avoid any stress build up in the structure at vulnerable points, thereby increasing the fatigue life of the boat dramatically. All deck edges are rounded to reduce windage. ( Ref. 2 and 3 ). The biggest challenge I faced from a styling and construction point of view was that I wanted the boat to retain all the beautiful features and lines of a non demountable boat. In the end, I am happy to say, that with the superb building effort of Marc Ginesty and his team, that has really been achieved. You have to be very close to see that the boat is demountable. The Accommodation is straightforward, with two pipecot berths either side in the flare of the main hull. A small galley beneath the cockpit sole, and a chart table and navigation area at the forward end of the saloon. Forward of the mast, the space is devoted to sail and general stowage. On deck, all controls lead to the cockpit, and with the perspex cuddy, a singlehanded helmsman can keep a lookout in shelter, while still able to grab the helm or get to the sheets easily and quickly if required. I had hoped that she would sail with just one rudder on the main hull like my earlier designs, but the boat has gone through the rudder barrier!, and will require at least a rudder on each outrigger. The problem is that with the increase in power to weight ratio, the main hull lifts sooner and the top of the rudder ventilates, sucking air down the blade. This can be controlled by reducing sail, but in the race where Mike capsized, they believed they were overhauling the 25% larger 'Aotea' (a 40ft Jim Antrim trimaran), and if they were right, they could have won the race. They hung on just too long. Once the boat stopped, with the spinnaker and full main drawing in a force 4, capsize was inevitable. Nai'a has turned out to be exceptionally fast for a 30 ft boat. I had hoped to have increased performance by at least 8% over Shockwave. This meant that whereas in force 3 to 4 Shockwave could do 11.5 knots hard on the wind and 19 reaching, I expected Nai'a to do 12.5 upwind and 20.5 reaching. In the first sailing trials in San Fransisco Bay we easily achieved these speeds, but already it was apparent that the rudder had a tendencey to ventilate at reaching speeds in the 17 or 18 knots range. After my return to England Mike calibrated the log using his GPS and found that it was underreading. Upwind speed is actually around 13.5 knots and off the wind more like 22.0. This means that we have increased performance by close to 18%, which is indeed an order of magnitude faster than any previous offshore 30ft racer. She is very powerful, and Mike and his crew are on the learning curve. When he returns this season with rudders on the outriggers, and fresh determination, I expect we will see some exciting performances from this beautifully built and meticulously prepared boat.